This is the fourth video programme that independent transport videos have produced with the Provincial Society. 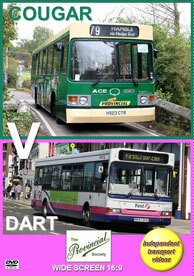 This time we look at two very significant buses that were operated by the company, the ACE Cougar and the Dennis Dart. This Wadham Stringer bodied Cougar was unique, produced by Albion Chassis Engineering and allocated fleet number 3, later to become 333 and latterly 800 with Firstbus. It was registered H523 CTR in 1990. The bus ran in ‘People’s Provincial’ two tone green and cream livery. When taken over by Firstbus the Cougar appeared in the Firstbus cream with a red trim scheme, which it carried until withdrawn from service in 2003. The bus was donated to the Society for preservation, and was initially parked at the Firstbus depot at Portswood, Southampton, before moving to a parking space in Botley, close to the Brijan Coaches depot. Here the bus was prepared for its life in preservation with a repaint into its original livery at the First in Hampshire & Dorset’s Hoeford Depot. The second bus that we are featuring on this programme is the very successful Dennis Dart SLF with Plaxton Pointer bodywork. This type of bus has been familiar all over the United Kingdom since its introduction, running with the large groups and small independents. The Plaxton Pointer Dart first appeared in service with Provincial on the 23rd November 1997. The example we used on the Society outing in September 2015 was not native to the south coast! 40827 (R647 DUS) entered service with First Glasgow in 1998 allocated to Larkfield depot, but was later cascaded to First Hampshire & Dorset. It is one of the few remaining in service at the time of filming that were identical to the ones operated by Provincial. By the end of 2015 the Dennis Dart would be retired from the now named First Hampshire & Dorset fleet, so it seemed fitting that a farewell tour should be instigated. Now it is time to compare both vehicles! We start our programme with the ACE Cougar and show some brief footage of it in service. Then the big day dawns for the Society! The 25th September 2004, the day the Cougar was collected from Southampton for its suspended tow to Bishop’s Waltham. We follow the procedure of it leaving Portswood depot to its arrival at Bishop’s Waltham. January 2005 we see the Cougar having an extensive clean for restoration work to begin. Some two years later on the 27th August 2007, we see the Cougar launched at the Society’s annual bus rally at Stokes Bay. The following month the Society members took the Cougar out on a tour of former People’s Provincial routes. An excellent trip and vehicle, we are sure you will agree! Now its time for the Dart to go through its paces! The 6th September 2015 is the date as we join 40827 at Fareham Bus Station for a tour of routes. This time we visit Portchester, Cosham, Denmead, Waterlooville and Portsmouth. From Portsmouth we retrace the 17 – 18 service, originally a Portsmouth City Transport route. We adorn the Dart’s cove panel with an original First route map. We then carry on to visit Cosham and Portchester again before the arrival back at Fareham Bus Station. Before leaving the Bus Station its just time to see other members of the First Hampshire & Dorset fleet going about their duties. So, its Cougar v Dart? Is there a winner? You decide!